Recipes like this could make me a vegan (again). Cauliflower is one of my most favorite foods, and I love roasting it, but roasting a whole head of it at once with chickpeas in a creamy, amazing-smelling tomato sauce spiced with Indian flavors was out of this world. I rarely try Indian recipes (the name for this is actually Gobhi Musallam) because I just don’t think I’m good at them, but this recipe was so simple anyone could do it, and everyone should. Brendan took one bite of this and sat back all, “Oh my god. This is amazing.” Ummm…I agree. I already can’t wait to have this for lunch tomorrow. 2. In a large pot, boil enough water to submerge the (washed, trimmed of leaves) cauliflower. Add the 1 tsp. salt and the 1/2 tsp. tumeric to the water, then blanch the cauliflower for about 5 minutes, or until mildly tender. Drain and set the whole head of cauliflower aside. 3. Meanwhile, melt the butter & EVOO in a large saucepan over medium heat. Add the chopped onions and cook until they start to brown, about 5 minutes. This entry was posted in cauliflower, chickpeas, family, indian, love, sant andrea, vegan on October 10, 2014 by westyn. …see what I did there (sorry)? You guys, I am officially, completely, 100% obsessed with my Nutribullet. Friends of mine who have one have been raving about it for months now, so I finally caved and got one. We’ve been throwing together smoothies for every breakfast, some snacks, etc. and I actually feel more energized than I have in weeks. This smoothie has a kale base that makes this a pretty green color, but other than that you can’t even taste it, then a bunch of fruit – mango, pineapple, banana and some orange juice too. It’s also great knowing that I’ve started off my day with a bunch of nutrients (and got to use a bendy straw, too – doesn’t everything just taste better with one??). 1. Combine all ingredients, in order listed, in a nutribullet (or blender, but make sure to blend this really, really well). Blend until combined and completely smooth. 2. Serve and start your day off right. 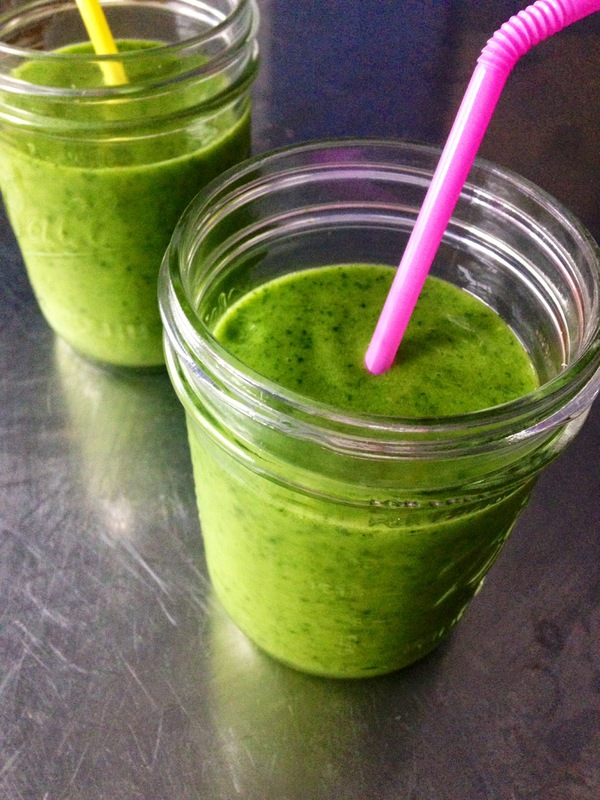 This entry was posted in drink your veggies, gluten-free, healthy, paleo, smoothies, vegan on September 9, 2014 by westyn. For the record, I think coleslaw is the worst. The name is bad, the texture is weird, the mayo-y ness of it is gross, it’s just yuck. That said: this is not coleslaw. This is antioxidant-rich shredded red cabbage (from the Scranton Farmer’s Market, hurraugh! ), carrots, cilantro and scallions, dressed with lime juice, rice vinegar, cumin and olive oil. It’s fantastic. We were making shredded chicken tacos with leftovers from a roasted chicken in lemon gold that we had for Sunday dinner, and decided it needed some crunch, so I threw this together and I’m so glad I did. Brendan came home, took one bite and said, “This tastes exactly like my favorite cabbage salad from my favorite Mexican restaurant in Colorado” soooo….you’re welcome, JBG. This was perfect on tacos, but honestly, I would (and did) eat this with a fork by itself. You can throw it together in 5 minutes, but make sure you let it marinate for about 30, so all the flavors come together into a little colorful shredded salad of deliciousness. 1. Slice the cabbage into thin strips. 2. In a small bowl, combine the lime juice, cumin, honey, rice vinegar & kosher salt & pepper. Whisk together so the seasonings can blend in well with the acids. Add EVOO and give everything a good mix so it emulsifies. 3. To the bowl with the cabbage, add the shredded carrots, chopped scallions and chopped cilantro. Mix to combine. 4. Top the cabbage mixture with the dressing and mix it all together really well. Cover and let it sit for approx. 30 minutes, stirring every once in a while to redistribute the dressing. 5. Serve on its own or on top of tacos for a perfect crunch and super bright flavor. 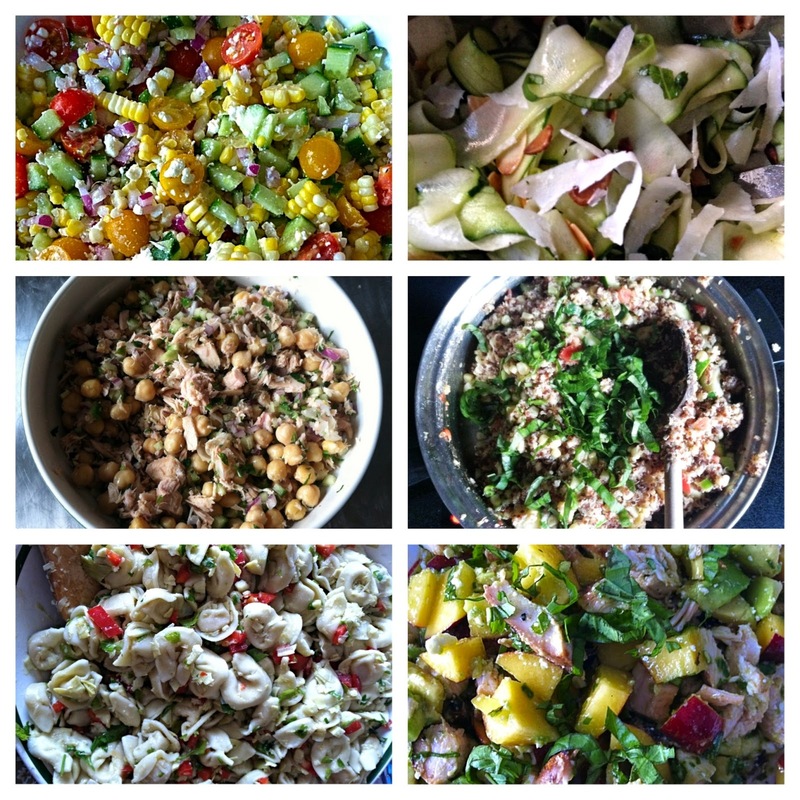 This entry was posted in farmers market, salad, vegan, vegetarian on August 20, 2014 by westyn. Hands up if you need a little detox after the 4th of July weekend. Oh, you too? We’re officially into July, you guys, so what better excuse to dig up some of my favorite summer salad recipes. With the exception of the tortellini (which is still a healthy, super tasty salad), these salads are all clean-eating recipes that you can make almost exclusively with produce found at your local Farmer’s Market. Best of all, they’re perfect for those mid-summer picnics…no mayo, nothing heavy, just bright flavors that take advantage of all the summer has to offer. So grab a produce bag and head down to the Farmer’s Market to pick up ingredients for some of the best summer salads on my list. I don’t know about you all, but my first thought this morning was that I’m only t-minus three weeks until vacation. Hope everyone had a great holiday weekend! This entry was posted in clean-eating, gluten-free, low-carb, paleo, salads, summer, vegan, veggies on July 7, 2014 by westyn. When I lived in Paris, I basically ate one of two things: Moroccan food or a baguette and a hunk of brie. I think it’s only because we walked everywhere that I stayed skinny, but man, I miss that 21 year old metabolism. This zucchini and chickpea blend has enough of that Moroccan spice to it that it makes me feel like I’m back in Paris again – plus it’s delicious, super quick to make and pretty healthy for you, too. AND, it has the bonus of being made with stuff you probably have in your refrigerator right now. LET’S MAKE IT!! – 1 tsp. kosher salt. 1. In a french oven (ooh, la la) melt the butter. Cook the onion over medium heat until translucent, approx. 5 minutes. 2. Add garlic and cook approx. 90 seconds, until fragrant. 3. Add paprika, cumin, oregano & tumeric and cook for 30 seconds. 4. Add broth, tomatoes & salt. Bring to a simmer and cook, covered for 10 minutes. 5. Add chickpeas & zucchini and cook, covered, until zucchini is just done (approx. 12 minutes longer). Make the couscous during this step so everything’s ready at the same time. 6. Add parsley & lemon juice, season to taste and serve over couscous. Congrats to everybody who ran the inaugural Scranton Half Marathon this past weekend – what a great day! This entry was posted in chickpeas, couscous, gluten-free, half marathon, healthy, moroccan, paleo, scranton, vegan, zucchini on April 8, 2014 by westyn. Oh, Gwyneth Paltrow. She seems to get a lot of shade thrown her way for the Goop blog, the way she can do things like ask her celeb friends not to do interviews with a magazine that’s threatening to expose her, her kids’ names, her “conscious uncoupling”…etc. I get it to some degree, but come on – she’s freaking Gwyenth Paltrow. She’s been in serious relationships with Brad Pitt, Ben Affleck and Chris Martin. She’s an Oscar winning actress. Her mom is Blythe Danner and her godfather is Steve Spielberg. She’s run in some pretty heavy circles probably since she was born, so can we really blame her for thinking it’s normal for everyone get a wood-fired oven in their backyard? I think her ‘I am who I am” attitude is judged as not apologetic enough, but honestly, if I were her I wouldn’t be apologetic for what I grew up in and what things I enjoy either. I think she just is who she is, and frankly, that seems pretty cool. To summarize: Get it, girl. Now, Anne Hathaway, on the other hand… Anyway, the recipes on Goop are awesome – super super clean, healthy and delicious. This salad is adapted, and I’m going to be making it alllllll the time. Brendan even said it was the best salad he’s ever had. – 1 bulb fennel, top parts cut off (but leaves saved), core removed. 1. With either a julienne slicer or a Cuisinart food processor with a slicer attachment, shave the fennel bulb and the apple into paper-thin slices (this really makes a difference in the overall salad). Put into a bigger bowl. 2. Over medium heat, toast the walnuts, shaking the pan every minute or so and making sure they don’t burn. 3. Zest and juice the lemon, then add to the bowl with the apple and fennel shavings. Add kosher salt & pepper, mix well to combine. 4. Add EVOO and walnuts, mix. Top with the toasted walnuts and a couple fennel leaves. 5. If using arugula, I just arranged some on a plate, juiced a little lemon over it, then added the apple/fennel salad on top of the arugula leaves. The apple/fennel dressing will work as enough dressing for the arugula. 6. We had this with salmon burgers with a simple lemony dill sauce on avocado toasts. So good. This entry was posted in apples, arugula, gluten-free, Goop, Gwyenth Paltrow, lemon, paleo, salad, vegan on April 3, 2014 by westyn. When I took the first bite of this, I didn’t know if I was crazy about it, and then I kept taking bites as I was making other things, and all of a sudden it just got delicious. I think the flavors really need to meld together with the dressing, so dress it at least 30 minutes before serving. Look at how pretty all that green is! – Kosher Salt & Pepper, to taste. 1. Cook the edamame according to package directions. Add to a medium-sized bowl and set aside to cool while you make the dressing. 2. Get a mason jar, and add the balsamic & rice vinegars. Add the kosher salt & pepper so they react with the vinegars, and shake it up a little. 3. Add the sesame oil to the vinegars, shake well to combine. 4. Chop some cilantro and slice the scallions. 5. To the bowl with the edamame, add mozzarella, cilantro, scallions, and sesame seeds. 6. Cube avocados. The easiest way to do this is to cut an avocado in half, get rid of the pit, then cut a grid into the avocado. Run your knife around the perimeter of the gridded avocado, and you should be able to squeeze out the avocado cubes. 7. Gently fold the avocado into the bowl with the edamame mix. Add the dressing and mix well to combine. This entry was posted in edamame, gluten-free, paleo, salad, spring, vegan on March 28, 2014 by westyn. This has the double benefit of being really great for you and also totally delicious. I would eat avocados and feta at just about every meal and on just about everything, so anytime I can combine those two things, plus get a filling breakfast, I’m down. – Good bread (this makes a difference, you want something a little hearty that will stand up against the avocado-feta mix). I used an organic rosemary-olive oil loaf this time. 1. Mash the avocados, then add the feta. Blend well and add Kosher salt to taste. 2. Spread on good toasted bread. Top with olive-oil poached eggs for a full heart-healthy fats and protein kind of breakfast. This entry was posted in avocado, breakfast, feta, paleo, toast, vegan, vegetarian on March 22, 2014 by westyn. I honestly couldn’t believe how delicious this was. It’s so light and pretty, the toasted almonds give it that added little crunch and substance, the julienned basil is lovely, and a simple lemon and EVOO dressing brings the whole thing together. Brendan took one bite and said, “I don’t even like raw zucchini, but this is amazing”. Ummm…agreed. I have a feeling I’m going to be making this a lot this summer. 1. Wash the zucchini, then peel into ribbons with a vegetable peeler. I tossed the very first peels that were all green, but kept the rest of them with some green on the sides for a little color. I also stopped when I got down to the seeded middle part, so that the ribbons looked nicer. Add zucchini ribbons to a large bowl. 2. Squeeze a lemon over the zucchini so that it really soaks in. Add the kosher salt and pepper, then use tongs to gently mix it all together. Let it sit and absorb while you make the rest of the salad. 3. Bring a small sauté pan to medium heat, then add almond slices. Shake the pan a couple of times and keep a close eye on these so they don’t burn. They should be toasted in 2-3 minutes, tops. Add almonds to the bowl with the zucchini. 4. Julienne some basil. You can chop it, but the ribbons of basil look so pretty with the ribbons of zucchini. All ribbons, all the time! To julienne, stack the leaves on top of each other, roll them into a little cigar-like shape, then slice from the top down. Throw the basil in with the zucchini and almonds. 5. Drizzle EVOO over everything, use the tongs to mix together. 6. Top with some curls of parmesan cheese. Serve immediately. This entry was posted in paleo, salad, vegan, vegetables, vegetarian, zucchini on March 15, 2014 by westyn.